Ooo! I love cheese, I really do! 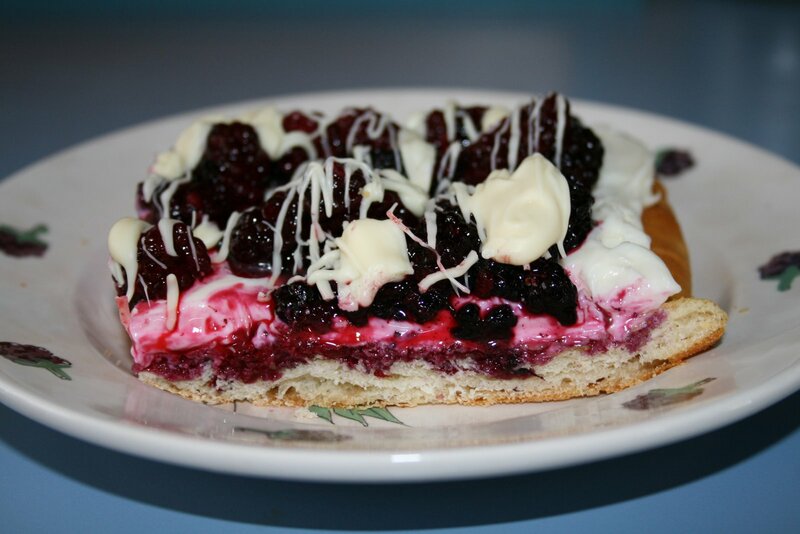 And berries are my favorite summer food to forage, so my most delicious dessert would be berry cream cheese pizza! I could nibble the entire thing in minutes, but I usually invite my forest friends to come into my burrow at the base of the tree and feast with me. But I don’t invite Bear—he eats too much and besides, he couldn’t possibly fit through the hole. If you want to squeak with delight, try this recipe! 2. Spread the dough over a cookie sheet, pressing the seams together with your paws to form the crust. 3. Bake this for 10-15 minutes until it’s the color of my fur, a light golden brown. 4. Use oven mitts to protect your paws and remove the cookie sheet. Let it cool completely. 5. Mix together the cream cheese and sugar. Spread this all over the cooled crust. 6. Now gently place the berries onto the cream cheese. No nibbling! 7. One minute at a time, melt the vanilla chips and oil in the microwave, blending after each minute (this is hard work for a little mouse). Lightly drizzle over the pizza. 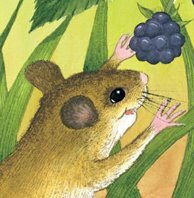 Chill and enjoy~ it’s so berry, berry good, it’s a mouse-ter-piece! Hi Brenda,By all means, share! I love the image of you reading Blackberry Banquet to the children as they munch along! And keep your eyes out for the next five weeks–I’ll be posting a new recipe each week, some of which will be recipes that children can make with a little supervision.